Emptiness is actually not empty. It is the source of all creations. Without it none of our world events would ever happen. Emptiness is a really serious matter. This lovely book needs to be read to understand the essence and importance of emptiness. In this post we will see a book about nothing! 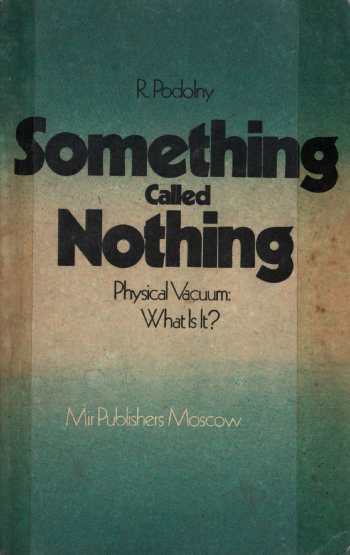 The curios title of the book is Something Called Nothing – Physical Vacuum: What Is It? by R. Podolny. What does emptiness consist of? On the face of it, this question seems senseless. Emptiness is called emptiness precisely because it consists of noting. But this is not exactly so. Absolute emptiness “exists” only theoretically. Real empty space, however, is not a simple void. It is a physical vacuum, a complex intermixture of spontaneously appearing and immediately vanishing fields. The deeper we penetrate into the region of ultrasmall scales, the more complex and rich properties of does this void – the vacuum – become.